Nonetheless, supporting the notion that BVXP has above-average investment potential is what seems to be a very respectable competitive position, the benefit of long-term royalty income, some impeccable financials and leadership through the group’s founder. 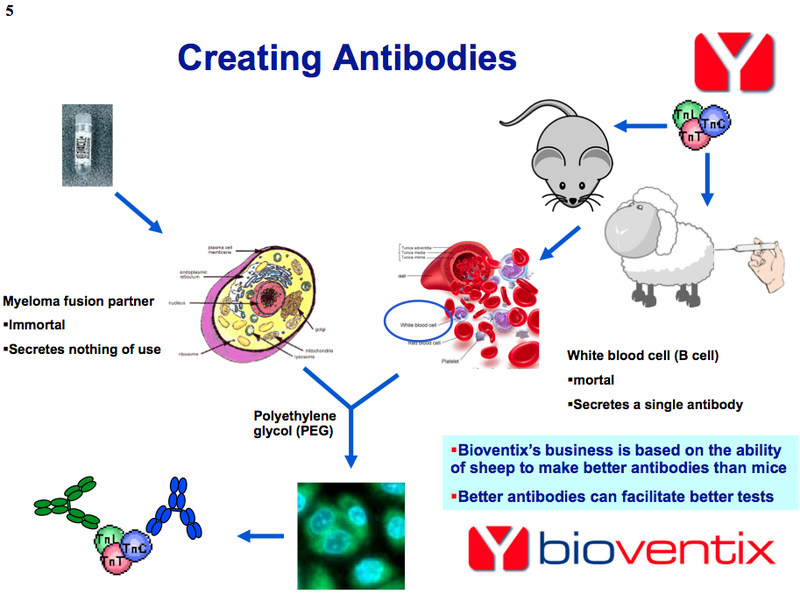 Bioventix (BVXP) can trace its origins back to the early 1990s, when Peter Harrison joined KS Biomedix and helped establish a division that created and manufactured sheep monoclonal antibodies. BVXP itself was formed during 2003, when KS Biomedix was acquired and Mr Harrison led a buy-out of his division’s facility and operations. BVXP’s monoclonal antibodies are used within blood tests to diagnose a range of conditions. I’ll spare you the science, suffice to say different BVXP antibodies can detect different elements within your blood and indicate the presence of heart disease, cancer, infertility, thyroid disorders, vitamin D deficiency and drug abuse. BVXP sells its antibodies to manufacturers of blood-test machines, and also earns revenue through a subsequent royalty payment every time one of its antibodies is used. The royalty agreement is generally arranged on a perpetual basis and is worth a small percentage of whatever the hospital pays for the blood test. In addition, BVXP collects relatively modest revenue from contract R&D work. I must confess that my scientific understanding of antibodies is quite limited. However, this informative one-hour video and accompanying presentation slides available at the excellent piworld.co.uk website have provided me with some useful insights into the business. In particular, Mr Harrison claims BVXP’s customers aren’t willing to switch to a comparable — but cheaper — antibody once they have established a suitable test with an existing supplier. You see, the cost and time (between two and four years) for the manufacturers of blood-test machines to trial and obtain regulatory approval for a copycat antibody apparently just isn’t worth the saving. 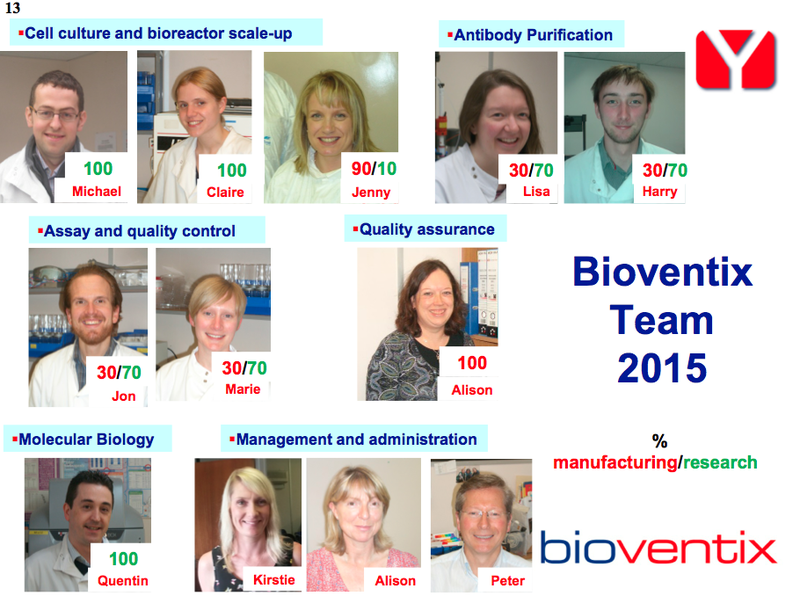 In fact, Mr Harrison reckons that no customer has ever dropped a working BVXP antibody from a blood-testing service. As such, BVXP’s products can have very long shelf lives and become quite dominant within certain blood-test diagnostics. The firm’s antibody for detecting thyroid disorders, for example, has been on the market since 1995 and currently boasts a worldwide market share of more than 50%. All this makes the royalties BVXP receives from its antibodies quite predictable — and lucrative. Once launched into the market, the antibodies are sold with little ongoing cost and their consumable nature underpins a repeatable income. Revenue is earned mostly from the United States and Europe. BVXP’s website offers further details of the science behind antibodies and the products provided. I have to admit that BVXP does not have the most comprehensive of financial track records. Skim through the archives at Companies House and you’ll discover an operating profit was first struck only in 2008 (£393k) after revenue had reached £1m. However, BVXP’s subsequent growth has been impressive. The firm floated on the ISDX market during 2010, at which point revenue was £1.6m and operating profit was £775k. 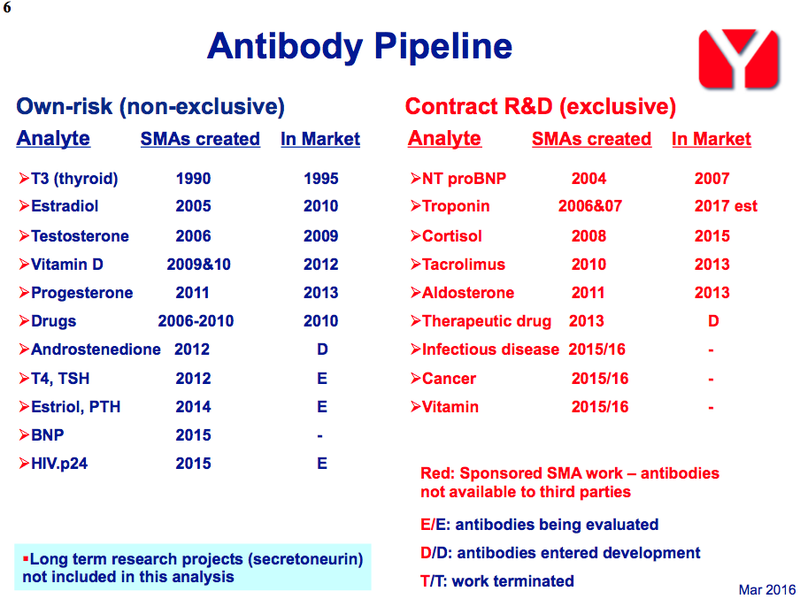 By 2015, and after benefitting from new antibodies, revenue had topped £4.3m while operating profit was £3.1m. I’m impressed that BVXP’s progress has seen revenue, profit and the dividend lifted every year as a quoted company. BVXP migrated to AIM during 2014, the costs of which prompted the firm’s sole exceptional item after joining ISDX. Another highlight for me is the complete absence of acquisitions. BVXP’s flawless expansion has ensured the share price has made good headway over time. Floated at 198p on ISDX, the shares today regained their £13 all-time high. First-half results published during March were very pleasing. Buoyed by greater sales of its vitamin D antibody, BVXP declared revenue up 23% to £2.4m, operating profit up 33% to £1.7m and an interim dividend up 50% to 16.5p per share. The group said its core business had “remained robust” and that it looked forward to the rest of the year “with confidence”. Then during August, BVXP confirmed its full-year revenue would be in excess of £5.3m — that is, at least 22% up on 2015. BVXP also declared that profit would be ahead of market expectations. A “strong performance” supplemented by favourable currency movements were cited for the out-performance. The firm’s 2016 annual results are due to be published on Monday, 17th October. A vital attraction to BVXP for me is the presence of the aforementioned Peter Harrison. I do like my shares to be run by ‘hands-on’, entrepreneurial and capable executives, and Mr Harrison seems to fit the bill perfectly. He has worked with antibodies since 1986, led BVXP’s buy-out in 2003, and has since overseen the group’s subsequent success. Mr Harrison owned 20% of BVXP when the business joined ISDX, although that stake has reduced to 12% following share sales at 425p and 800p. Nevertheless, his remaining shareholding is currently worth £8m — which I hope will still give him the ‘owner’s eye’. I suppose Mr Harrison’s share sales are understandable given he collected a salary of only c£70k — with no bonus — during BVXP’s stint on ISDX. BVXP’s 2015 annual report does not disclose Mr Harrison’s individual salary, but the AIM admission document from 2014 indicated a £120,000 wage. That payment does look somewhat ‘thin cat’ for a business with a trailing £3.5m operating profit. Indeed, the whole boardroom cost just £168k last year — Mr Harrison is the sole executive and is accompanied by three non-execs (one of which provides accountancy services as a ‘financial director’). Another positive remuneration sign is that options currently represent less than 1% of the share count. I should add that Mr Harrison is 57 years old, so he ought to have a few more years in charge at BVXP before reaching standard retirement age. BVXP’s accounts are some of the best I have ever encountered. Meanwhile, the balance sheet carries no debt and no pension obligations, while the interims from March reported cash at a healthy £4.6m (90p per share). BVXP’s bank balance all looks surplus to requirements to me. The group also owns its £375k freehold office and laboratory. Cash generation seems very good, too. In addition, the aggregate £1.5m or so absorbed into working capital during the last five years looks quite understandable when you consider operating profit has tripled to £3m since 2011. The eye-popping margins and asset-light nature of the business translate into some exceptional return on average equity (ROAE) calculations. The average from the last five years is a super 104% (adjusted for the cash position). Here’s how I decided it was worth investing at 1,133p following the publication of the August trading statement. I took the £5.3m minimum revenue figure BVXP expected for the 2016 results, and applied the 89% gross margin witnessed during the first half to give a gross profit of £4.7m. I then subtracted £900k — double the £445k operating costs reported during the first half — to arrive at a £3.8m operating profit. I then applied tax at 16% (as per the first-half results), which gave me earnings of £3.2m or 62.9p per share. After that I subtracted the first-half net cash position of £4.6m, or 90p per share, from the then £57.8m market cap, to arrive at an enterprise value (EV) of roughly £53m or 1,043p per share. The potential P/E on my EV and EPS estimates was therefore 1,043p/62.9p or 16.6. I admit that a 16-17 multiple is not a bargain, but it seemed reasonable enough to me given BVXP’s very attractive financials and its record of growing at an average annual 20%-plus throughout the last five years. My BVXP investment is not without risk. One threat is the upcoming loss of income from an antibody that diagnoses and assesses the severity of heart failure. That earlier video presentation revealed revenue of about £700k would disappear from August 2017 following the expiry of a ten-year royalty agreement. Given the group’s astronomic margins, that loss of revenue could have a material effect on earnings. However, BVXP is confident the lost revenue will be offset by income produced by a new antibody that tests for the likelihood of heart attacks. Developed for Siemens, this new antibody is expected to be launched sometime during 2017 and should earn — so BVXP claims — “significant” revenue. Whether everything evens out during 2017 remains to be seen. At least BVXP says it has only one or two other antibodies left that have fixed-term royalty periods, and that these products are not major money-spinners and will only see their income disappear after 2020. The rest of BVXP’s antibodies enjoy royalty income in perpetuity. Other dangers to this investment include a concentrated customer base and the very small size of the operation itself. Apparently there are only five major manufacturers of blood-test machines — Roche, Siemens, Abbott, Becton Coulter and Johnson & Johnson. As such, the loss of just one customer — perhaps through consolidation — could have a very detrimental effect on BVXP’s progress. I just wonder whether this business can continue to enjoy such immense margins by paying a dozen science boffins somewhat ordinary wages (average staff cost for 2015: £48k). Will there come a time when the workers demand a much greater reward for their efforts — and a greater cut of that lucrative royalty income? Finally, I must not forget the inherent risk of R&D setbacks within the biotech sector. BVXP has a number of antibodies within its in-house development pipeline and, put simply, there is no guarantee any of them will eventually earn a penny. As such, £500k-plus of R&D expenditure could be going to waste every year, leaving growth beyond that new antibody for Siemens somewhat elusive. I’ve already admitted that I may have been late to the party with BVXP. I first looked at the share last year at 850p and yet two months ago I decided to buy at 1,133p. One shrewd investor even spotted the opportunity at 450p. Mind you, not getting in on the ground floor does not necessarily mean BVXP’s shares won’t enjoy further gains from here. My estimated P/E may not be a bargain, but often it can be worth ‘paying up’ for growth… and the potential growth in this particular situation is backed by very lucrative royalty revenue. True, next year may well witness a temporary setback, as income from a new antibody may not entirely cover the loss of income from an older antibody. But I’d like to think positive progress will resume in earnest by 2018. Furthermore, there appears to be a very worthwhile competitive position to underpin future developments. For now, though, BVXP’s 2016 results will be published next week… and I just hope they are as good as I expect! Interesting to see the shares up nearly 16% on nearly triple the average volume not sure why but not getting too excited…just yet. Thanks Dave. I have read the price rise was due to a recommendation in Penny Share Letter. Thanks for the article. I appreciate the effort and time required to publish these. This company remains me of Rightmove on the features you described. We shouldn’t overlook the fact that it’s a small business with 50% of market share and deals with multi-billion dollar companies. The superior margins will continue to exist because it won’t make a dent in the operating costs of the “bigwig” pharma. What would I like to know is there other competitors or new technology likely to disrupt its business model? BVXP has 50% market share of one particular blood-test antibody. Not all of BVXP’s products have such dominance though. I suspect there are other competitors, but I don’t know who they all are. A simple online search revealed only http://www.randox-lifesciences.com involved in sheep monoclonal antibodies. I don’t feel there is a new technology around the corner about to disrupt the sector, but I am simply a layman here. Perhaps there could be scientific breakthroughs that could enhance the research and development of antibodies for blood tests. 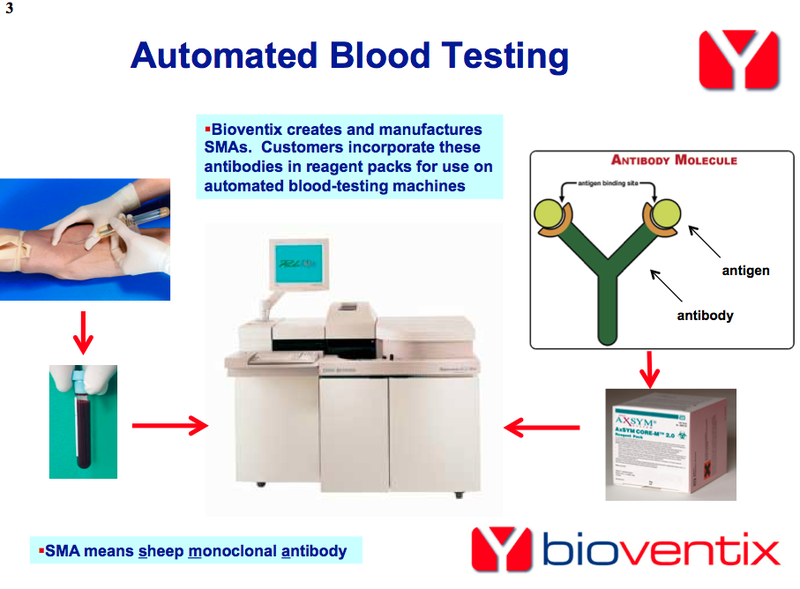 My understanding of the way this blood-test sector works is that a new antibody test has to be produce notably better results (in terms of time, accuracy etc) for the machine manufacturers to adopt it. BVXP results looked good, were they up to your expectations? This video interview with chief exec Peter Harrison addresses my questions of customer consolidation and staff pay. He does not appear to be too concerned.